PONTIAC, Mich. — A world away from the halls of Harvard University, where he recently became president, Lawrence Bacow found himself this week in a low-slung brick building that looked anything but prestigious, surrounded by students for whom an elite education has felt out of reach. Everything Harvard is, Pontiac is not. Few of the city’s residents have graduated from college and many live below the poverty line. But at Pontiac’s International Technology Academy, Bacow had come to bridge that gap with his own personal story, returning to the community where he grew up to preach the gospel of education with himself as case study number one. The trip marked the first major move of his presidency, which began in July when he promised a more outward-facing style that would use the megaphone that the post affords. 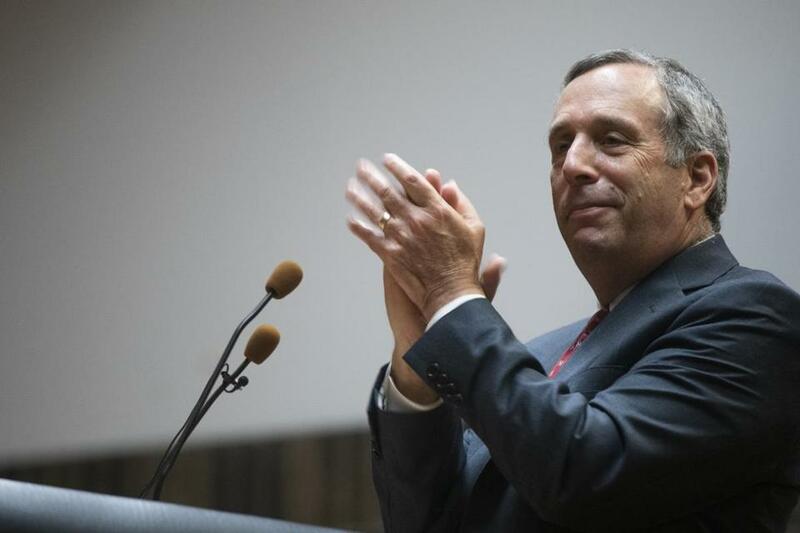 “I want to try to make the case that colleges and universities are really a pathway to opportunity for so many,” Bacow said this week. And that is what he did on Thursday, to an auditorium of students, nearly all black and Latino, who sat in silence. He reminded them that they have the intellect and the grit to succeed at a place like Harvard, or any other college in America. “I’m here to tell you that higher education can create pathways for you that are unimaginable today,” Bacow said. Bacow said that especially now, when swaths of the country have been left behind economically and when some political voices question the value of a degree, he feels called to spread this message to places where maybe it has been forgotten. In Pontiac, a former automobile town, most students overcome obstacles just to get to school every day. Drugs and violence have taken a toll on the city, which until last year was under state control because of major financial problems. “I’ve seen really really smart people go down the wrong path and make a big mistake and their whole future just changes,” said Anaria’ Kyles, 15. She and her friend Kennedy Dunlap are juniors at International Technology Academy. Both have big plans for their future. Kyles wants to own a beauty salon in Pontiac. Dunlap is aiming to be a sports medicine doctor. Both young women are part of a coalition that encourages young people to stay away from drugs and violence. They are watching their futures diverge from those of their peers. “I see what they’re doing, I see where they’re going, and it’s kind of sad because I see where I’m going, too. That’s why I kind of get distant because I don’t want to go down their path,” said Dunlap, 16.
International Technology Academy is a magnet school and the most elite in the district. Students apply to attend and many take dual enrollment college courses. They wear blue blazers and have a robotics laboratory. On Thursday the halls echoed with students rolling balls down ramps and timing the results for an Algebra 2 assignment about functions. This school fares better than others in the district, which is still under state control because of its own budget problems. Bacow described for the students his childhood in Pontiac as the son of two Eastern European refugees, his mother a Holocaust survivor. His father was the only one of his siblings to attend college, parking cars to pay his way for night school at Wayne State University, the public college in Detroit. If not for his father’s determination, Bacow said, he would not have had his own illustrious career as an MIT professor, MIT chancellor, president of Tufts University, and now president of Harvard. “Don’t let anybody ever tell you that you can’t pursue your dreams. You can,” Bacow said. On Friday, he spoke in Detroit at an event to welcome native Detroiters back home and involve them in the city’s revitalization. Bacow described how much Pontiac has changed in the years since he left. When he was young, he said, you could graduate from high school on a Friday, go to work at GM Truck & Coach on a Monday, and be guaranteed a comfortable middle-class life in which your children could go to great universities and graduate without debt. “That’s all changed, and I think all of us in higher education have a responsibility to ensure that the next generation has opportunities in the same way that we did,” he said. Bacow’s goal is not to persuade every student to apply to Harvard. He is more interested in touting the benefits of places like Wayne State, and in pushing state legislatures to reverse their trend of sagging support for public education. There should be good colleges and universities in every part of the country to offer students the chance at a good life, he said. “Talent is flatly distributed, opportunity is not, and so we really need to make sure that talented kids have the same opportunities,” Bacow said. As Bacow spoke to the students in Pontiac, Joshua Kozlowski stood in the back of the auditorium. An English teacher, he has taught seven years in the district and watched it struggle through financial problems and now begin to rebound. Kozlowski said that more than anything he tries to teach his students that they have the potential to compete with the smartest students in America. Bacow’s visit will help. Students listening to Bacow were fixated on the extraordinary cost of an elite education. When he took questions, the first student asked how much it costs to go to Harvard. “Whoaaaaa,” came a collective gasp from the students. Not so fast, Bacow said. He explained how the university gives need-based scholarships to many students and full scholarships, including room and board, to families that make less than $65,000 annually. Everyone clapped. That matters in Pontiac because the average family income is $30,000, according to the most recent census data. A third of the city’s residents live below the poverty line and while almost 80 percent have a high school diploma, just 12 percent have a bachelors' degree. Carrington took office in 2015 when the district was $51 million in debt and under emergency state control. Now that deficit has shrunk to under $10 million. Art and music courses were reintroduced this year, and for the first time in a long time, enrollment across the district rose. The school district is still under a level of state control, but the situation is improving, according to the principal.